Holstein and Jersey cows are among the most popular and well-known breeds of cattle. The large black and white Holstein, which is also known as the Friesian, is a familiar sight in farms around the world. Gentle, fawn colored Jerseys are also well-known in many parts of the world. Both breeds are particularly important for dairy farming. Holstein cows are large black and white cows. Some cows are more black than white, while others are mostly white with some patches of black. In some cases, Holstein cattle are actually red and white instead of black and white. An adult Holstein will usually be about 580 kilograms in weight and they will be about 147 centimeters or 58 inches tall, at shoulder height. Jersey cows are known for their gentle dispositions, as well as for their characteristic appearance. Jersey cows are significantly smaller than Holsteins and they also differ significantly in coloring and appearance. Being smaller, Jerseys can be cheaper and easier to keep than larger breeds of cattle. Jerseys are usually brown or fawn colored. Jersey cows usually weigh between 360 and 540 kilograms. The bulls are also fairly small, usually weighing between 540 and 820 kilograms. Unlike the cows, Jersey bulls are particularly aggressive. Fawn is the most common color for Jersey cows, but they can range in color between black and light tan. Purebred Jerseys have characteristic patterns of lighter coloring around their muzzles, dark hair in the switch at the end of their tail and black hooves. Holstein cows are a common choice for dairy farmers because they have the highest rates of milk production of any breed of cattle. Holstein cows can produce an average of 7,655 liters of milk a year, although pedigree animals can produce more milk. The lifetime milk production of a Holstein cow will be about 26,000 liters. Jersey cows are also best known as dairy cows, but it is for the quality of the milk rather than their productivity that they are known. The milk produced by Jersey cows has a high butterfat content, which makes it much richer and creamier than the milk of other breeds of cattle. Jersey milk contains about six percent butterfat and four percent protein. Holstein or Friesian cattle were originally bred by farmers in Friesland and North Holland, two provinces in the region that is now the Netherlands. The success of cattle breeding in this region meant that the cattle became a desirable export for many other parts of the world, where high quality, productive dairy cows were needed. About 8,800 Holsteins were brought into the Americas in order to provide stock for dairy herds. Jersey cows come from the island of Jersey, which is one of the Channel Islands that lie between Britain and France. 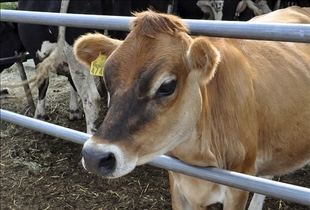 Jersey cows are still common on the island, but they have also been exported to other parts of the world, such as Britain. Jersey cows can thrive in hot climates, so they have also been exported to tropical regions, such as Brazil. The purity of the breed in Jersey has been preserved by restrictions on the import of cattle into the island. Outside of Jersey, the breed is often mixed with other breeds of cattle since it can bring some good characteristics such as a gentle temperament and high fertility into mixed breeds. Cross-bred cows with Jersey ancestry are particularly common in India. 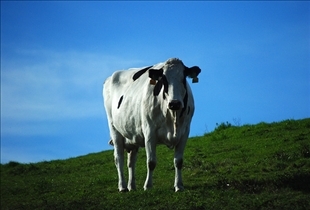 Holstein and Jersey cattle are two European breeds that are commonly used as dairy cows. Jersey cows are known for their gentle dispositions. Holsteins are a large breed, while Jerseys are usually small. Jersey cows are usually fawn colored, while Holsteins have black and white patches. Holsteins can produce a large amount of milk,Jerseys produce particularly creamy milk.